This hamper will earn you 50 Hamper Points. 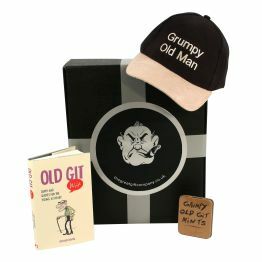 The Old Git Gift Box contains - Grumpy Old Man baseball cap -a good quality baseball cap with a base of dark navy cotton and adjustable brass clip. The peak is covered in soft suede - Old Git Wit Book full of witticisms - Grumpy Old Git Mints. The gifts are presented in a very smart gift box, wrapped in gaffer tape (no ribbons for these chaps!) Go on - we dare you to!